I am reading a fiction book about the life of Rahab. In my book, Jericho has fallen and she is now living with the children of Israel. She is learning about God and learning the Law. She just witnessed her first sacrifice for sin. She was called forth to put her hands upon the head of the lamb and then it was slain. The author described her reaction, her fear, her confusion, her humbleness before the Lord. It made me stop and think about what the sacrifice of the lamb represented – Jesus. I thought about His sacrifice for my sin. And I wondered, do I truly appreciate and understand that act of love? I don’t think I do, at least not like I should. So, for a moment, put yourself in Rahab’s shoes as she placed her hands upon that lamb’s head. I’m sure she thought of all the sins that she had committed. She probably thought of all the lies she had told, all the men she had been with, all the evil thoughts she had about others. Maybe all those things paraded through her head like a bad slide show. And then, she felt the life go out of the lamb. At that instance, she knew that the innocent lamb had taken her place for the sins she had “given” to the lamb. Sin has a price and the payment was the lamb. My sin has a price. All the bad thoughts, judgments, laziness, lack of self control, bad choices – all of them have a price. And that price was paid with the blood of Jesus at Calvary. I can say that all day long, but do I let it seep into my heart? Do I let it flood my soul and appreciate what He truly did for me? I need to do better. We are a generation of entitlement and don’t really stop and consider the sacrifice that someone else does for us. There is less appreciation for our military who give their lives for our freedom. There is less appreciation for our police who sacrifice to keep us safe. There is less appreciation for our teachers who educate our children. There is less appreciation for our medical personnel who study and sacrifice all kinds of things to keep us healthy. Everywhere you look you can see the failure of someone to appreciate the sacrifice that someone else has willingly done for them. No better place is this seen than in the church houses of our country where the neglect of the sacrifice of Jesus Christ is seen vividly by the declining numbers in attendance. And I am guilty, to a point. There are times when I feel like I need to rest and I stay home from a service. The Holy Spirit gets ahold of me and won’t let go. And for that, I am grateful – I know God is working in my life. But I shouldn’t even allow that thought in my head. It doesn’t show appreciation and gratitude for the sacrifice Jesus gave for me. So let me encourage you, take some time and read back through the requirements for sacrifices in the Old Testament. Read them, study them and compare them to the life of Christ. See His fulfillment of the requirements with His life and His blood. And then, thank Him genuinely for His sacrifice for you. Yesterday, I had a patient that was a young teenager in Munich during World War II. I had a million questions to ask her, but since it was our initial meeting, I kept them to a minimum. As I was laying in bed last night thinking and praying about my day, many of the people I have treated in the past came back to my memory. I saw their faces. I remembered their story. I remembered our story. It made me smile. I have been so blessed to have had so many truly amazing and history filled people in my life. I treated a man who survived the beaches of Normandy. I have treated people who have overcome significant medical incidents. I have treated many completely ordinary people with extraordinary personalities – beautiful souls with hearts to share. I have treated people who have challenged me physically, emotionally and spiritually. I have cried in the bathroom because they passed away. I have listened to them cry and have laughed profusely with them. I have been there when they did something they never thought they could do. So as I was thinking about all of this, this verse came to my mind. The thing that I have right here and right now is my strength. Oh, I’m not ready to compete in any competitions but I can hold my own, so to speak. But I try to be strong emotionally and spiritually too. Sometimes people need that just as much as they need my physical strength. I do this because one day, I will be the gray head. I will be the one telling stories and crying with some poor soul that has to try and teach me how to get in and out of bed. Truly, I hope the Lord comes back before then. But if He delays, I know He will send me someone like me to laugh and cry with. My point is this, our aging population is vitally important. They have so much to offer. We can’t neglect or forget about them. They need love and compassion and respect. God has them here to teach us and nurture us and love us in a way that we don’t yet comprehend. So reach out to that person that is struggling to get their groceries in the car. Reach out to that neighbor who can’t easily bring in their garbage cans. Take some time to listen to their stories and hear the desires of their heart. God has them here for you. Love them. Happy Friday. Ok, first of all – if you aren’t familiar with KJV, “charity” means “love”. Charity is an old English word for love. Have you ever had a situation in your life in which someone you care about doesn’t do or act the way that you think they should? Their decisions don’t line up with what you are expecting. You think that your way is the correct and only way to handle the situation. And when the person you care about takes a path different from the one you had laid out in your head, well, that just won’t do. You get all in a fuss and begin to question their ability to choose for themself. You think they need an intervention. What they really need is love (go ahead – let you inner Beatle go at it!). When you love someone (and I’m not just talking about your spouse – I’m talking about ANYBODY you care about), these verses cover them. That means that you (and I) need to invoke all these wonderful attributes into that relationship. Patience, kindness, lack of pride, unselfishness, long suffering- these are the kinds of actions that need to be present whenever we love someone. But when they are thinking and behaving outside of our realm of what we believe for them, it gets tough. As long as they are within our little box for them, we are good – no relationship strains or challenges. But we all know that no one stays in the box. People are constantly outside their little box we give them to exist in. And that’s where we have to put love into action. We need to be patient with them, give them space to think things through and make their own choices. And when those choices don’t look like what we think they should, we have to be kind and long suffering. We haven’t walked in their shoes. We have walked alongside them, but to know the real ins and outs of what is going on inside their head is impossible. We have to remove our prideful and selfish behaviors that want to step in and intervene. They don’t need us to tell them what to do. They need us to listen and understand that they are trying to figure out what is next. We all deal with life and situations differently. We see problems in a variety of lights. We view opportunities with unique perspectives. Loving someone means respecting that uniqueness and embracing the time that it takes them to sort it all out. So today, maybe you have someone in your life that is trying to figure it all out. Maybe that person is going through major life changes or maybe they are just having one of those days. Either way, love them as the Holy Spirit instructed Paul to tell us here in these verses. You may not understand their choices, their problems or their thought process but remember that you don’t have to – you just need to bathe them in prayer and let Jesus take control of the situation. We can only walk so far with them, but He can walk the entire way. If you are wondering where I have been and why I haven’t been posting, my family and I went to Washington DC for spring break. We had a great time, good laughs and really tired feet! I’m sure we walked an average of 8-10 miles per day. Lots to see and do in that great city. But our main focus, as is most who visit DC, was history. We went to several museums, monuments and buildings. We saw plaques proclaiming everything from George Washington’s gavel to lay the cornerstone for the Capitol to a box car used to carry people to concentration camps. It was all very moving. It called to rememberance great highs in our nations history and deep valleys in our world’s history. We were reminded of triumphs and challenges. We saw beautiful specticals of natural and great works of human hands. Just like so many of the others who walked beside us, we took our children to educate them. We want them to know and understand who we are as a nation, where we came from and why it is so important to preserve what our forefathers achieved. So many outside forces are working against our great nation. People want to tear down and destroy freedom and the pursuit of happiness. They think that the pursuit should be more of a handout. Some want to surpress freedom to keep from offending others. The founders of our country wanted nothing more than to live their lives apart from someone else’s control. They believed that only One should have control – God. They believed He founded and blessed this nation. I believe that as well. I believe that we must remember our past and honor our future by preserving and adhering to the principles set forth all those years ago. History is not just something to skim over and get through in school. It is the basis for everything that we do each and every day. And not only is our nation’s history important, but so is our spiritual history. His story is important. The founders of our country knew it and we would do well to take it to heart as well. I know that everyone who reads this doesn’t necessarily have children. But we all have children in our life. And the same principles apply to them and to the adults in our life as well. It’s about living in peace. Yesterday as we were driving home from soccer practice, my son was concerned over a text he received from a friend, who happens to be a girl. She was having symptoms of a panic attack stemming from an argument that she had with her mother. When I heard this, it truly burdened my heart. It made me sad. What is going on in our homes? I am not naive enough to think that people are living peaceably with teens and preteens all the time. I know that hormones and society and many other factors are and can be given the opportunity to wreak havoc on our children. But how do we follow the commands of the Lord and not provoke our children to wrath in this delicate time? How do we keep our teens following after Him instead of following after the world? I’m not the perfect parent by any stretch of the means. I just TRY to follow the commands of The Word and do the best I can with what God has given me. Before my children were born, I found a poem at an art show. I had to buy it because it exemplified exactly how I wanted to bring my children up in this world. 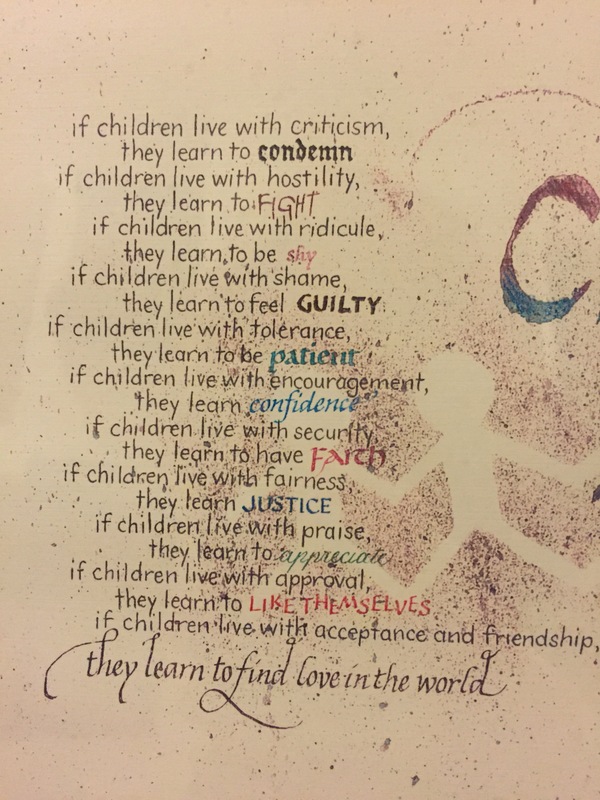 It is titled “Children live what they learn”. It has made me think, over the years, about what and how I am teaching my children. So how do we live peaceably with those around us? One of my main attempts is through respect. I want to respect my children. I want to respect my husband. I want to respect my family, my church, my government, my work, my patients, the person at the grocery store who is tying up the cashier, the crazy person who cut me off in traffic, and I could go on and on! When people feel they are respected, their attitude, and mine, take on a whole new demeanor. So let me encourage you, whether you have children or not, to be respectful and do not promote others to wrath. Yep, it’s hard sometimes because people make us so mad, but how would Jesus handle the situation? Jesus dealt with teenagers too. You know there had to be some in His following. I’m sure they spoke with Him as well. We have no record of it but how could He not have interacted with them? But one thing Jesus did do, He respected everyone – from the highest official to the lowest beggar. And we should do the same.